The best thing to come to the world of energy shots, Energy 2000 packs all the punch of a full size energy drink into a fast, easy and effective shot. For those who lead active lives and care about value, Energy 2000 packs into one bottle an energy blend of 2200 mg, with ZERO sugar and more energy. No other product can give you this long lasting effect in a 2 oz bottle. With all the energy drinks and drink shots out there, how does someone choose which product gives the fastest energy boost for the best value? We made an energy drink shot that tastes good and works. 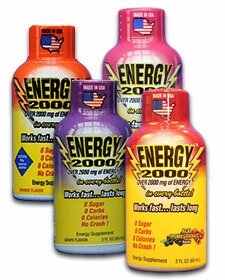 Energy 2000 is setting a new standard for speed and effectiveness with hours of energy and no crash or jitters. You feel it in minutes and it last for hours. Our potent formula is recommended for anyone who needs fast energy that will last.